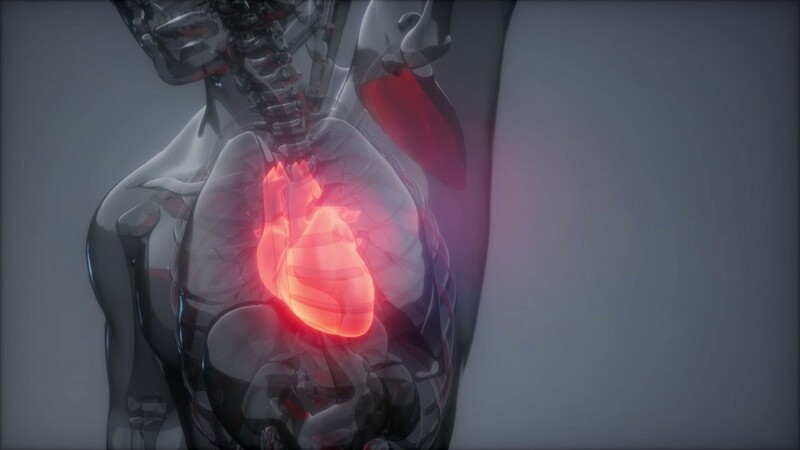 A heart attack usually occurs when a blood clot blocks blood flow to the heart. In 2016, the American Heart Association reported that 15.5 million people over 20 years of age in the U.S. suffer from coronary artery disease. Amazingly, it is estimated that every 42 seconds, a person in the U.S. will suffer a heart attack. These are sobering statistics that healthcare professionals most must be aware of when evaluating patients experiencing chest pain. Although death from coronary artery disease has declined over the last few decades, coronary artery disease remains the leading cause of death in the U.S., accounting for approximately one-third of all deaths in people older than 35. Acute Coronary Syndrome is caused by the sudden decrease in blood flow to the heart. When blood flow to coronary arteries become blocked from plaque build-up (atherosclerotic disease), the heart muscle is deprived of the oxygenated enriched blood it needs to remain healthy. If diagnosed early, coronary artery disease usually can be effectively treated without corresponding long-term heart damage. However, a life-threatening medical catastrophe can occur with delays in the diagnosis and treatment of coronary artery disease. Medical malpractice cases involving a delay in the diagnosis of coronary artery disease seem to follow a similar fact pattern, that begins with chest pain. Chest pain is a leading causing for ER visits in the U.S. with upwards of 6 million visits each year. Patients present to the ER, an Urgicare Center or a physician office complaining of chest pain, either intermittent or progressive, that radiates into the shoulders, arms, and jaw or becomes worse with exertion. These patients require more than an EKG to rule out a cardiac source, most often, coronary artery disease, as the cause of their chest pain. Unfortunately, based solely upon a normal EKG, patients are discharged prematurely with wrong diagnoses of gastric reflux disease, gallbladder disease, chest wall strains or panic disorders. Some of these patients will, unfortunately, succumb to a fatal heart attack days afterward. The most serious risk posed by coronary artery disease is sudden death due to heart failure. Upon autopsy, 90 plus percent of sudden heart death victims, have 2 or more coronary arteries that are dangerously narrowed or blocked entirely by plaque. As shown in the illustration, when coronary arteries become blocked, those areas of the heart supplied by the block are deprived of blood flow. When this happens, if the blockage goes untreated, the heart muscle (myocardium) stops contracting normally and eventually will die (myocardial infarction). While some risk factors for coronary artery disease can be determined by visual observation alone, others can only be identified by a careful history obtained by a knowledgeable healthcare provider. Personal or family history of coronary artery disease. A patient who is experiencing chest pain with exertion and has any of these risk factors must be evaluated for coronary artery disease. His or her life depends upon it. EKG Evaluation – A 12 lead EKG permits trained professionals to determine whether a patient is experiencing ischemic chest pain from coronary artery disease or if the patient already has suffered a heart attack. To this end, there are certain abnormal EKG findings, such as ST segment elevations or depressions and T wave inversions which are strong indicators of coronary artery disease. However, EKG testing is not foolproof as patients with coronary artery disease can have a normal EKG. Cardiac Enzymes – Troponin is a protein that is especially sensitive for diagnosing heart muscle damage. When heart muscle is injured or dies from the lack of adequate blood flow due to blocked coronary arteries, their contents are released into the bloodstream. Because muscle proteins are not usually found in the bloodstream, their presence in the blood is highly suggestive of muscle damage or death. Elevations in Troponin levels, especially elevations that occur over time, are confirmatory of heart muscle or death, likely due to coronary artery disease. Serial Troponins obtained upon arrival, at 4 hours and against at 8 hours, is required as patients with rising Troponin levels have coronary artery disease until proven otherwise. Echocardiogram – This is an ultrasound that enables evaluation of the heart’s shape and size, how it is contracting and how its valves are operating. While not diagnostic of coronary artery disease, its findings can provide valuable diagnostic information. Cardiac Catheterization – This is the “Gold Standard” for diagnosing coronary artery disease. Those patients with abnormal EKG findings or elevated Troponin levels need to be evaluated by cardiac catheterization, also known as angiography. Depending upon the results of the catheterization, the patient may undergo the insertion of a cardiac stent to keep the blocked artery open. If stenting is not possible, the patient may require cardiac bypass graft (CABG) surgery. Patients with ACS caused by coronary artery disease often experience chest pain that increases in intensity and frequency. The administration of Nitroglycerine will dilate the coronary arteries and decrease the patient’s pain by increasing the blood flow. The patient also can be administered Heparin as it will prevent blood clot formation that potentially can cause a heart attack. Depending upon the severity of the blockage, the artery can be opened during a cardiac catheterization and a stent or multiple stents then inserted to keep the artery open. If the blockage is too severe, then the patient will require more extensive bypass surgery. Despite the presence of easy to perform and highly sensitive testing to diagnose coronary artery disease, many patients who present to healthcare providers with chest pain are wrongly diagnosed with gastric reflux disease or less serious conditions, such as a chest wall muscle strain, or anxiety. Different studies have estimated that upwards of 4 percent of patients with ACS are wrongly discharged from ERs, placing them at significantly increased risk for a fatal heart attack. Obtain a history to assess the patient’s risk factors for coronary artery disease. Maintain the patient comfortable with prior pain medication and supplemental oxygen, if needed. Perform and properly interpret a 12 lead EKG. Administers anticoagulant medications, such as Heparin to prevent clot formation.